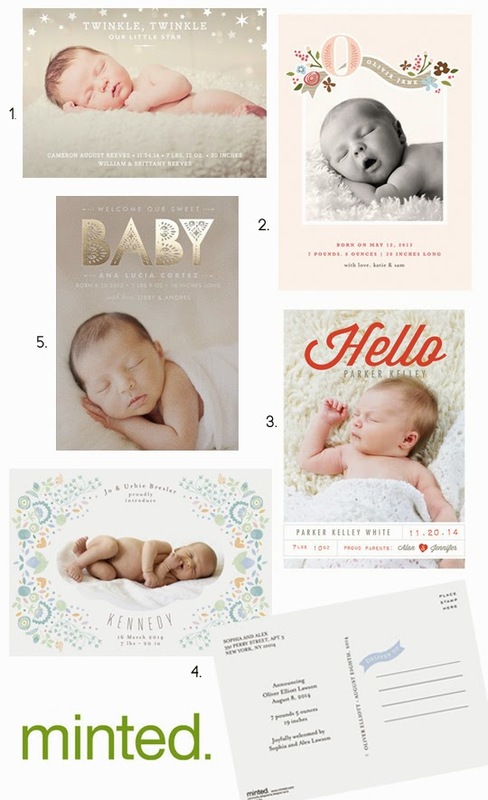 Birth Announcements + Minted.com Giveaway! This pregnancy is going by so fast that I'm already looking at birth announcements! With only 5-6 weeks to go, I've been visiting Minted.com - one of my favorite stationary and gifts online stores - for options. From postcards to foil pressed announcements, their unique collections are always some of my favorites. Take a look at some of my favorites below. And now that Mother's Day is behind is, it's time to start thinking about celebrating the special men in our lives. Check out Father's Day gift and card collection available on Minted.com. ABOUT MINTED Minted is the world's premier marketplace for independent design. Their mission is to find exceptional artists and designers from all over the world and bring their work to consumers who appreciate great design. Minted sources design and art from a global community of independent designers, then sells their best designs as fine products such as stationery, wall art, and décor for the home, holidays, and occasions. GIVEAWAY Enter for a chance to win a $100 credit to Minted.com! I love their art, like "Poly Agate"
Love their birth announcements and I especially like the addressed envelopes for you -- something I could get started before baby arrives so that sending birth announcements is speedier during those busy newborn days. I'm obsessed with Minted. I get my Christmas cards from them every year and have a few birth announcements I'm eyeing for baby Charlie! Love their art prints, and am all about their new notebook series!! I love their foil cards. I chose these for our sons birth announcements. So gorgeous! I love the Retro Floral Garden Personalizable Bunting Banner. I'm loving the sliced citrus personalized stationery! I love the Lace and Kraft stationary in Lavender. I love the birth announcements. Our little guy was born on 4/14 and I really need to send some out. I like the Modern Moniker design. I would love to make birth announcements for my little one who is due July 4th! I like the Simply Christmas Christmas Photo Cards.